The Egg Hunt has ended. Thank you to all those who participated. We'll be contacting the winner of the grand prize shortly. 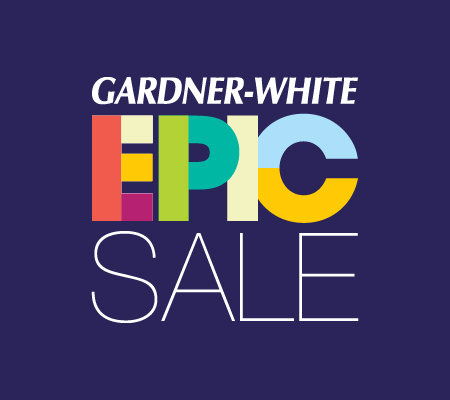 Get $1 off your qualifying Gardner-White purchase for each egg you find (up to $100 off). Before you head out to the store, click the "Redeem" button below. We'll send you an email with a special code that your salesperson will use toward your next qualifying purchase. You can click the "Redeem" button as often as you'd like, but you can only use that code once. Please sign in to redeem your Gardner-White cash. $1 Gift Certificates will be awarded for every egg found online. Minimum 10 eggs, maximum $100 off. You may redeem your gift certificate on this page after finding at least 10 eggs. One grand prize winner will be chosen at random from the customers that find over 100 eggs to receive a $1000 gift certificate. Gift certificates can be applied to purchases made April 10 – April 24. Minimum purchase $399. One gift certificate per person may be redeemed. Cannot combine gift certificates. 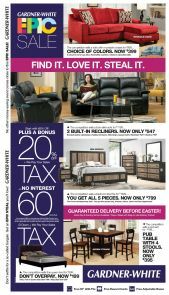 Cannot be used on purchases before 04/10/19, Tempur-Pedic®, clearance or floor samples. Must be redeemed by 04/24/19. Find out where you rank against the other egg hunters out there.